There has been a growing interest in the rational design of multi-targeted drugs with the aim of enhancing overall efficacy and/or improving safety. The development of multi-targeted drugs might yield new avenues in the treatment of cancers that involve multiple pathogenic factors. In this review, we focus on the multi-targeted metal-based anticancer agents, which include platinum, ruthenium, rhodium, gold, silver, copper, cobalt, zinc, and nickel complexes. 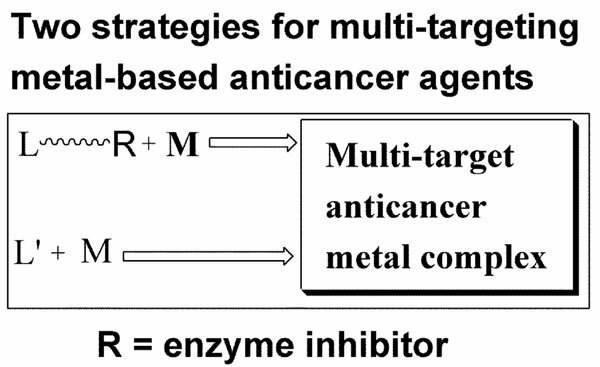 Future directions for the development of multi-targeted metal-based anticancer agents are also proposed. Multi-target, metal complexes, cytotoxicity, anticancer agents, nickel complexes, pathogenic factors.